Since March 2017, Connecticut has experienced a handful of deaths connected to a new designer drug. It is an especially potent form of fentanyl the Federal Drug Enforcement Agency has yet to call a controlled substance and technically, that means it is not illegal. Regular fentanyl is a potent synthetic opioid, about 100 times stronger than morphine, according to the DEA. Experts now say acrylfentanyl might be even more dangerous. And what is scarier is that doctors are worried the drug commonly used to counteract overdoses might be resistant to this new strain. From the suburbs - including two connected deaths in Bristol and one in Canton - to the cities, with two deaths in Hartford - acrylfentanyl has arrived in Connecticut. "Acryl fentanyl is one of the synthetic opioids," said Dr. J. Craig Allen, the medical director at Rushford, part of Hartford Healthcare in Meriden. "It's very frightening, it's terrifying." Since March, five fatal overdoses have tested positive for acrylfentanyl in Connecticut. Allen said the chemicals were developed and researched, then shelved to avoid human use. "But they're now being re-circulated, and the problem is, they're very, very potent,” Allen said. This is causing users looking for a fast fix to quite possibly drop dead. "The risks are that people who think they're getting heroin, or think they're getting something that is less potent, may use the same amount of this new substance and it will shut down their respiratory drive and with fentanyl and acrylfentanyl that happens so much quicker than it does with heroin," Allen said. Officials are also worried acrylfentanyl might be resistant to the overdose-reversal drug naloxone, which is commonly known by its brand name, Narcan, which has saved hundreds of lives across Connecticut. "The problem is, as these synthetic opioids become more and more potent, they attach with a much greater stronger affinity to the receptor and they hold on for longer periods of time. So you may need multiple doses of naloxone in order to knock those substances off. And there's a possibility that the naloxone even with multiple tries, it might not work so it's really, really important to remember to call 911 before you do anything,” Allen said. Like witnesses did in both fatal overdoses in Hartford. 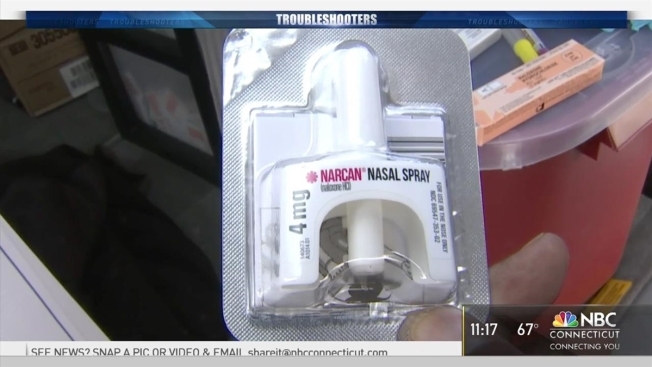 “We understand the Narcan might not work on every case of fentanyl overdose and we're certainly trained on how to address that and generally with more doses of Narcan, we're prepared to do that," Hartford Police Deputy Chief Brian Foley said. Foley said his department, like many others NBC Connecticut spoke with, shares acrylfentanyl intelligence among local law enforcement, and across state lines. In fact, Vermont authorities just issued a bulletin that was shared with all Hartford police personnel. "We have to notify our user population and keep them constantly updated as to what is going on, and you're seeing everyone that can reach out to the user population, are doing that. Unfortunately it's a sickness and despite the toxicity and different types of fentanyl, users are going to use," Foley said. Mark Jenkins, who founded the Greater Hartford Harm Reduction Coalition, is armed with generous supplies of Narcan and needles to help those in need. Jenkins said that if the naloxone doesn't work, you should question what else is in somebody's system. “Poly-substance abuse or poly-substance use is so common, so we don't know if there was alcohol? Also, in the toxicology, benzos on board? That may make it more resistant to the naloxone," Jenkins said. Dr. Allen said families facing addiction at home, really need to make sure they can perform CPR and not forget to call 911 immediately in an emergency. By email, the Assistant Special Agent in Charge of the DEA New Haven told NBC Connecticut, “As of right now Acryl Fentanyl is not yet a scheduled substance but DEA is in the process of making it a scheduled substance. In order to do this DEA must make notifications to the public to give individuals the right to fight it if they can prove there are legitimate needs for this drug. Sometimes this can take upwards of a few months. This makes our job very difficult because we are trying our best to stay on top of all the different forms of fentanyl being produced out there (mostly from China) and all it take is for these so called chemists out there to switch one molecule in the drug and it now makes it a different strain of fentanyl which would then not be a controlled substance yet,” ASAC Brian Boyle said.